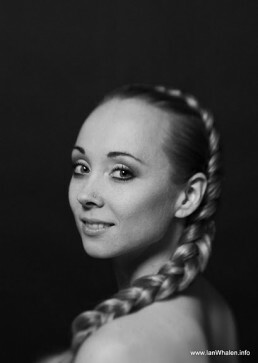 Ukrainian born, Anna Merkulova is a Principal with the Semperoper Ballett and trained with the Donetsk Choreographic School, Ukraine. She won 2nd Prize at the International Ballet Competition Kharkiv, Ukraine in 1994 and was a finalist at the International Ballet and Modern Dance Competition Nagoya, Japan in 1998. Before joining the Semperoper Ballett she also performed with the Donetsk Academic State Opera and Ballet Theatre Ukraine, Fouette Youth Ballet Estonia, Dance Alive USA, Bay Area Houston Ballet Theatre USA and the Tivoli Pantomime Theatre Denmark. Her repertoire includes roles such as Aurora in The Sleeping Beauty (Aaron S. Watkin after M. Petipa), Marie, The Sugar Plum Fairy in The Nutcracker (Aaron S. Watkin/Jason Beechey after M. Petipa), Aldonza in Don Quixote (Aaron S. Watkin), Juliet in Romeo and Juliet & created the role of Cinderella in Cinderella (Stijn Celis), Manon in Manon (Kenneth MacMillan),Theme and Variation, Emeralds & Rubies from Jewels, Swanhilda in Coppélia (George Balanchine), Isolde in Tristan+Isolde, Bride in Giselle, Mourning Ground, The World According To Us, Das Vershwundene | The Disappeared, The Grey Area (David Dawson), Impressing the Czar, The Vertigenous Thrill of Exactitude, Enemy In The Figure, Artifact Suite, New Sleep Pas de deux, New Suite, In The Middle Somewhat Elevated (William Forsythe). Additionally, throughout her career she has been involved in numerous creations and Principal and Soloist roles in works by Jiří Kylián, Mats Ek, Johann Inger, Jacopo Godani, Ohad Naharin and Pascal Touzeau.